Key difference: A petrol engine is an internal combustion engine with spark-ignition. As its name suggests it runs on petrol, also known as gasoline. Hence, a petrol engine is also known as a gasoline engine, especially in North America. A diesel engine is an internal combustion engine that runs on diesel. It is also known as a compression-ignition engine. In a diesel engine, only the air is compressed and the fuel is injected into very hot air at the end of the compression stroke. The engine uses the heat of compression to initiate the ignition. Hence, a diesel engine is self-igniting. Automobile, autocar, motor car or car is essentially a vehicle that runs on an engine or a motor. While there are many types of engines in the market, there are two most commonly used engines. 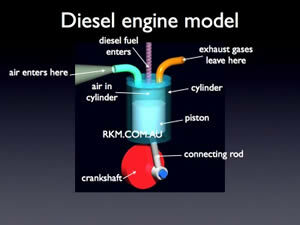 These are the petrol engine and the diesel engine. Other types of engines may be electrical engine, or even a hybrid engine. A petrol engine is an internal combustion engine with spark-ignition. As its name suggests it runs on petrol, also known as gasoline. Hence, a petrol engine is also known as a gasoline engine, especially in North America. The petrol engine was first invented in 1876 in Europe. After which many different models improving on it were released. In most petrol engines, the fuel and air are usually pre-mixed before compression. However, some modern petrol engines now use cylinder-direct petrol injection. The pre-mixing is done by an electronically controlled fuel injection, except in small engines. 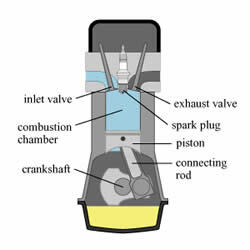 The spark plug is then used to initiate the combustion process. A diesel engine is an internal combustion engine that runs on diesel. It is also known as a compression-ignition engine. In a diesel engine, only the air is compressed and the fuel is injected into very hot air at the end of the compression stroke. The engine uses the heat of compression to initiate the ignition. Hence, a diesel engine is self-igniting. The ignition process involves burning the fuel that has been injected into the combustion chamber. The diesel engine was first developed by German inventor Rudolf Diesel in 1893. However, the diesel engine was not used in an automobile before the 1930s. Still, diesel cars did not get popular until the 1970s. As compared to other combustion engines, internal or external, the diesel engine has the highest thermal efficiency. This is mainly due to the engine’s very high compression ratio. There are two main types of diesel engines: two-stroke and four-stroke engines. A two-stroke, two-cycle, or two-cycle engine is a type of internal combustion engine which completes a power cycle in only one crankshaft revolution and with two strokes, i.e. up and down movements of the piston. Comparatively, a four-stroke engine or a four-cycle engine is an internal combustion engine which completes a power cycle in four separate strokes during two separate revolutions of the engine's crankshaft, and one single thermodynamic cycle. The four strokes include intake, compression, power, and exhaust. The main difference between a petrol engine and a diesel engine is the fact that a petrol engine uses spark plugs to initiate the combustion process, while a diesel engine uses the heat of compression to self-ignite. Furthermore, petrol engines tend to run faster than diesel, mainly due to the lighter pistons, connecting rods and crankshaft. Another reason is that petrol burns faster than diesel, hence energy is released faster. Also, a petrol engine tends to have lower efficiency than a diesel engine due to its lower compression ratios. They burn less fuel than a petrol engine to do the same amount of work. They can convert over 45% of the fuel energy into mechanical energy, while petrol engines can only convert 30%. This results in a better mileage. They have high reliability and easy adaptation to damp environments due to the absence of a high voltage electrical ignition system. They do not have coils, spark plug wires, etc. The radio frequency emissions from these can interfere with navigation and communication equipment. The life of a diesel engine is generally about twice as long as that of a petrol engine. The parts used to create a diesel engine have increased strength. Diesel fuel has better lubrication properties than petrol. Diesel fuel is considered safer than petrol in many applications. Diesel fuel is less flammable than petrol and has reduced risk of exploding. Diesel engines are immune to vapor lock, as diesel fuel does not release a large amount of flammable vapor. Diesel engines generate less waste heat in cooling and exhaust. Diesel engines can accept super- or turbo-charging pressure without any natural limit. Petrol engines inevitably suffer detonation at higher pressure. Diesel engines’ exhaust contains minimal carbon monoxide. Many diesel engines can easily run on biodiesel. However, due to the above mentioned reasons, diesel cars tend to cost more than petrol cars. Still, due to the better mileage, the cost may effectively be comparable over time. However, this will not be the case for people who do not drive their cars as much and over great distances. Also, while comparing cost, one must also keep in mind that over time the cost of the car will depreciate, i.e. go down. Furthermore, diesel cars are also better for the environment, as they generate fewer emissions than petrol cars. Due to this, as of 2007, about 50% of all new car sales in Europe are diesel.